Sonoma State University is bringing the international flavor to students on campus. International Education Week, Nov. 13-17, exhibits a celebration of different cultures from around the world. 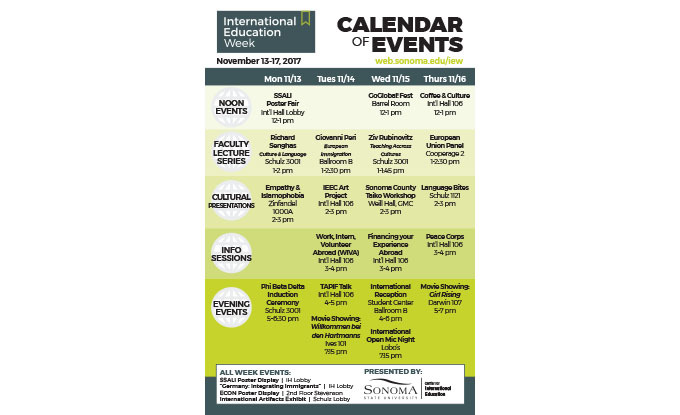 For a full schedule of events, see Sonoma State's Center for International Education. International Education Week starts off the weeklong schedule of events with a special poster fair presentation on Monday at noon in International Hall by Sonoma State American Institute students. The posters will be up throughout the whole week. The students from Japan, Korea, China, Vietnam, Saudi Arabia and Mexico will share and present their posters about their home cultures and will be presenting on different cultural topics like food, customs, and greetings. International students also gain experience from studying in a unique place like Sonoma State University says Eyler. “Sonoma State has a feel that you don’t see on the news, says Eyler “This university is a good reflection of what California and the US. We have a personality that is unique that other CSU’s don’t offer. Following the student presentation, SSU Anthropology Professor Dr. Richard Senghas holds a special lecture on “The Influence of Culture on Sign Language: Why Living in Sweden Helped Me Learn about Nicaraguan Sign Language” in Schultz 3001 at 1 p.m. Senghas will speak about his experience studying foreign languages in another country. Along with fun workshops highlighting the taste of coffee and chocolate from around the world and a Taiko drumming performance, International Education Week also ventures into more serious territory with the EU Panel Discussion talk, "Germany and the EU's Triple Crises: Brexit, the Euro, and the Refugee Crisis." This talk will feature German Deputy Consul Patrick Heinz, Foreign Language Teaching Assistant Rebecca Meier, Professor Dr. Florence Bouvet, and Dr. Cynthia Boaz explores the effects of Brexit felt around the world and the difficult reality of the refugee crisis across the European Union. International Education Week also offers informational sessions to students wanting to start their own unique global journey. Whether a student wants to study abroad, join the Peace Corps or work, intern, or volunteer abroad with WIVA, students will be able to hear all these options for themselves. Students that are interested in starting their study abroad adventure are encouraged to go to an information session so students learn how to finance their experience abroad. Students will be taught how to apply for scholarships and grants successfully, as well as other ways to raise money to fulfill their study abroad adventure. 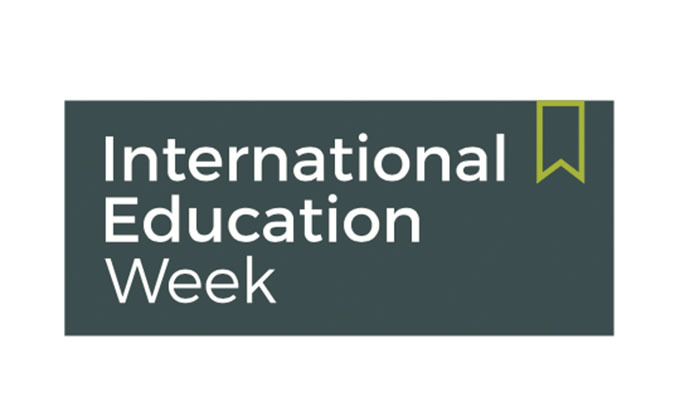 International Education Week is sponsored by the U.S. Department of State’s Bureau of Educational and Cultural Affairs, as well as the U.S. Department of Education. The annual week of celebration is observed across the United States and around the world each November, typically the week before Thanksgiving.